1. The air pressure of car’s tire is 432 kPa with the temperature of 15 oC. After several hours, the pressure of air is 492 kPa. If expansion ignored, what is the temperature of air in the tire? 2. Ideal gases in a closed container with volume V, pressure P, and temperature T. If its volume becomes ½ times the initial volume and its temperature becomes 4 times the initial temperature, what is the air pressure in the system. 3. 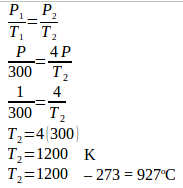 Ideal gases initially in a container with volume V, temperature T, and pressure P. If gas heated so its temperature becomes 3/2 T and its pressure becomes 4/3 P, what is the volume of gas. 4. 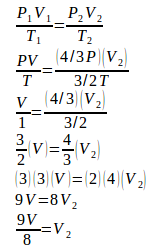 Ideal gases initially in a container with volume V and pressure P. If the temperature of gas becomes 5/4 T and its volume becomes ¾ V, what is the final pressure of the gas. 5. 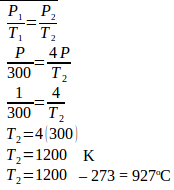 Ideal gases initially in a container with volume V at temperature T and pressure P. If the temperature of gas becomes 3/2 T and its pressure becomes 2P, what is the final volume of gas. 6. Ideal gases initially in a container with volume V at temperature T and pressure P. If the temperature of gas becomes 2T and pressure of gas becomes 3/2 P, what is the final volume of gas. 7. The initial temperature of an ideal gas in a closed container is 27°C. If the final pressure is 4 times the initial pressure, what is the final temperature of the container? 8. In a closed container, the gas volume expands to 2 times the initial volume (Vo = initial volume, Po = initial pressure) and the temperature of gas becomes 4 times the initial temperature. What is the final pressure of the gas? 9. An ideal gas in closed container initially at 27°C. If the final pressure is 4 times the initial pressure, what is the temperature of the container? Closed container = constant volume = isochoric process. 10. An ideal gas undergoes the isothermal process, so its pressure becomes 2 times the initial pressure. What is the final volume? 11. An ideal gas in a closed container with pressure P, volume V and temperature T. The final temperature is 2T and the final volume is 3/2 V. What is the ratio of the initial pressure (P1) to the final pressure (P2). 12. Oxygen gas with volume V, temperature T and pressure P in a closed container. The final volume of the oxygen gas is 3/4 V and the final temperature is 3/2 T. What is the ratio of the initial pressure to the final pressure. 13. An ideal gas initially in a container with a volume of V, the temperature of T and pressure of P. If the ideal gas heated so its temperature becomes 3/2 T and its pressure becomes 4/3 P, then what is the final volume of the ideal gas. 14. An ideal gas in a container with a volume of V1, the temperature of T1 and pressure of P1. 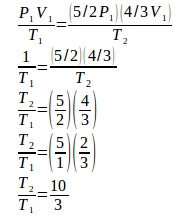 Then the gas heated so its volume becomes 4/3 V1 and its pressure become 5/2 P1. 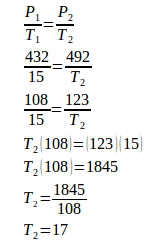 Determine the comparison of the final temperature and the initial temperature of the gas.